The brainchild of J.J. Abrams and one of the first movies to be directed by Matt Reeves, Cloverfield takes a Godzilla premise and combines it with the "found footage" movie concept that titles like The Blair Witch Project made so popular. The concept probably shouldn't work, but thanks to the creative minds behind the camera (and, let's be honest, the sort of 9/11 paranoia that the movie induces - being set in the heart of New York City), the movie is a tension-filled rollercoaster and holds up well even though it has been a full decade since its original release (yes, it has been that long). The storyline is designed according to what Roger Ebert used to call the "Dead Teenager Movie," which is a film where a young cast of actors is slowly picked off one by one by some threating menace (usually a serial killer). Here, the "teenagers" are a little older - 20-something and recent college grads and the "serial killer" is a big monster, but you get the gist. The suspense comes from where and how the monster will attack next and which person will be the next to go. 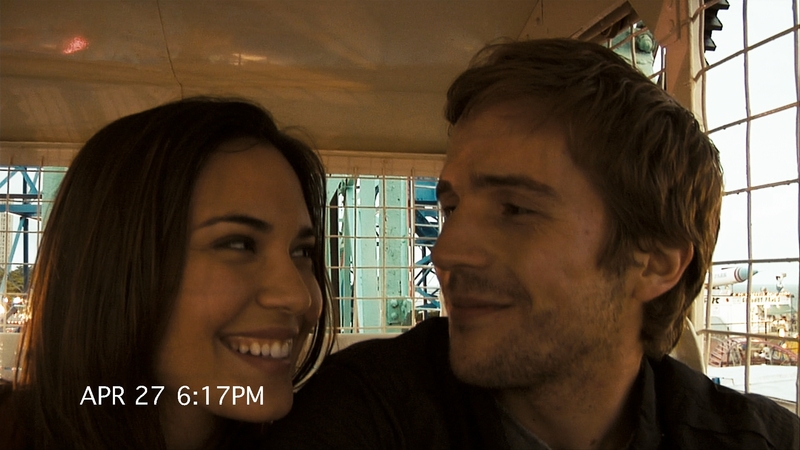 Cloverfield stars Michael Stahl-David as Rob, who is getting ready to leave to Japan for a new job opportunity and gets a surprise party thrown for him in his New York City loft by all of his friends (and he seems to have a lot of them). For the majority of the movie, it's friend "Hud" (T.J. Miller) who does all the hand-held camera work - meaning we hear him, but don't see much of him, throughout the film. Others involved include Rob's brother Jason (Mike Vogel) and his girlfriend Lily (Jessica Ford); Marlena (Lizzy Caplan), a girl Hud has the hots for (she barely knows he exists, naturally); and Beth (Odette Yustman), who Rob is in love with but hasn't told yet. The movie only runs about 85 minutes (with almost 10 minutes of end credits) and the actual attack by the monster doesn't begin until around the 18-minute mark, meaning there's a long time (too long, in this reviewer's opinion) to wait until the "fun" begins. The purpose of this is, of course, to try and get the audience invested in some of the characters, but honestly most of them aren't very well developed. You'll most likely care about the fates of Rob and Beth and find the rest of the cast pretty dismissible...fortunately, our monsters feels the same way about them. It's not a question of "if" they'll go, but how and when. Cloverfield, of course, has spawned its own little franchise of movies, although I would have been happy if they had just ended things with this one. Which it not to say that 10 Cloverfield Lane isn't a great film. In fact, it's actually better than this movie, but - let's be honest - it's not really a Cloverfield movie...it's a movie that tries to stuff itself into the Cloverfield universe in the last 10 minutes, which is the worst part of that story. And the less said about Netflix's The Cloverfield Paradox the better. What makes Cloverfield so much fun is that we don't get answers about the monster's origin, where it might come from, and what its purpose is. Hollywood used to make movies all the time that didn't answer all the questions, and Cloverfield is a great throwback to those types of sci-fi/horror films. So forget those sequels (and the ones yet to come) and just enjoy this one for what it is: a pretty entertaining thrill ride. Cloverfield invades 4K Ultra HD with the 4K and 50GB Blu-ray housed inside a black Elite keepcase along with an insert containing a code for both an UltraViolet and iTunes digital copy of the movie. A slipcover with artwork that matches the keepcase slides overtop. Neither the 4K disc nor the Blu-ray are front-loaded with any trailers, although the 4K disc will ask viewers to select a language before going to the main menu. The main menus are designed the same on both discs, with a montage of shaky-cam footage from the movie and menu selections horizontally across the bottom of the screen. The Blu-ray in this release is region-free, and the 4K disc, of course, has no region coding. 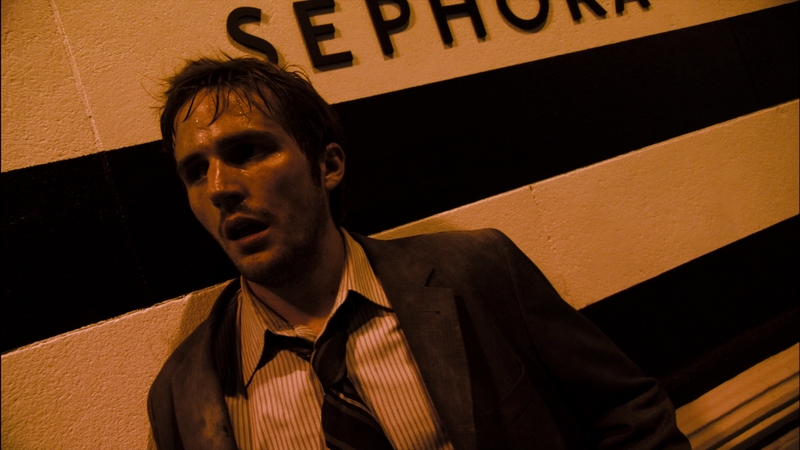 Cloverfield was shot digitally on a number of different digital cameras, including the hand-held consumer-grade Panasonic AG-HSC1U. More high-end (for the time) digital cameras were used as well, including the Panavision Genesis and the Sony CineAlta F23. Since Cloverfield was shot primarily on a home video camera (with those few exceptions listed above), the question must be asked if 4K looks any better than standard Blu-ray. The answer is yes, it does, but really only in terms of the contrast. Thanks to the HDR boost (Dolby Vision is also available for those with compatible players and TVs), the picture has deeper colors and hues than before. However, this is not necessarily a good thing, since the whole point of the image is to make it look like it's shot on home video. The deeper contrasts make the movie look a little more professional in the process, and I actually think Cloverfield loses some of its appeal in the new format. While the picture does get that contrast boost, detail isn't much of an improvement over the Blu-ray. Black levels are a tad better, but the image still has its limitations. Overall, this might be the first 4K Ultra HD release where the image improvement actually takes a bit away from one's enjoyment of the movie, and perhaps the filmmakers' intent as well. The featured audio on the 4K disc is the same English 5.1 Dolby TrueHD track that is on Blu-ray, but oh what a track it is! From low, rumbling explosions to alien attacks to jets streaking through the air, this is about the best you'll find in 5.1 lossless audio. While the video quality is designed to give the look of home video, the audio track here rivals any big budget film out there (even the ones coming out today, to say nothing of those from a decade ago - when Cloverfield hit theaters). The track is well-rendered, completely immersive, with lots of surround activity. Yes, it might have been nice for Paramount to take time to give the 4K release an Atmos upgrade - but why bother? This track is perfect just the way it is and reference-quality stuff. In Addition to the lossless English TrueHD track, the 4K disc also offers and English Audio Description track and 5.1 Dolby Digital tracks in French (Canadian), French (Parisian), Spanish (Latin), Portuguese (Brazil), German, and Japanese. Subtitles are an option in English, English SDH, French (Canadian), French (Parisian), Spanish (Latin), Portuguese (Brazil), German, Japanese, Dutch, Danish, Finnish, Norwegian, and Swedish. Note: The director's commentary track listed below is on both the 4K and Blu-ray discs. All other bonus features listed are on the Blu-ray only. Commentary by Director Matt Reeves - The director of Cloverfield talks about how he came to direct the movie and provides a lot of fun and informative stories about the actors and how the movie was shot. It's an entertaining listen worth checking out. Special Investigation Mode - This nifty bonus feature plays the entire movie a window that covers the top and right two-thirds of the screen. On the left of the screen is a map of the area of New York city where the monster attacks, along tracking of the monster, the humans, or the military's activity. In another window below the movie, viewers are treated to a text commentary with information about what we're seeing and hearing. Document 01.18.08: The Making of Cloverfield (HD 28:22) - A entertaining behind-the-scenes look at the making of the film, featuring comments from producers J.J. Abrams and Bryan Burk, director Matt Reeves, and other members of the cast and crew. Cloverfield Visual Effects (HD 22:32) - An extensive look at how the special effects were done on a relatively limited budget. I Saw It! It's Alive! It's Huge! (HD 5:53) - A look at the origins of the monster in Cloverfield and the work done on bringing it to life in the movie. Clover Fun (HD 3:56) - A nice collection of bloopers and flubs that took place during the shoot. As gag reels go, this is a pretty good one. Deleted Scenes (HD 3:25) - A collection of four deleted scene from the movie, each with an optional commentary by director Matt Reeves. These scenes can be watched together or individually, and consist of: "Congrats Rob" (0:22), "When You're in Japan" (1:23), "I Call That a Date" (0:44), and "It's Going to Hurt" (0:56). Alternate Endings (HD 4:29) - A pair of alternate endings, once again with optional by director Matt Reeves and the option to watch them together or individually. These are simply labeled Alternate Ending 1 (2:06) and Alternate Ending 2 (2:22). Still as much fun now as it was a decade ago, I was pleasantly surprised at how well Cloverfield holds up. But the problem here isn't with the movie itself - it's that the 4K upgrade doesn't add a whole lot in terms of video quality and what it does add makes the image look less like it's shot on a home video camera - which is the whole point of the presentation. When you factor that with the fact that this release offers nothing new over the Blu-ray in terms of bonus materials or the featured audio track, this 4K Ultra HD falls firmly in the "look before you buy" category, as fans will want to decide if the image enhancement is worth double dipping (assuming one already owns the Blu-ray release). Rent It.